We know men's fashion-and so will you, when you're wearing this elegant Slim Fit French Cuff Tuxedo Dress Shirt, something every man needs in his wardrobe, and have dressed our most sophisticated clients, providing outstanding quality and craftsmanship, with a wing tip collar construction is perfect for the traditionalist. A staple fashion shirt in formalwear, This shirt is made of a 60% cotton/ 40% polyester blend fabric which resists fading, shrinking, and is easy to care for. Once you try this shirt, you will never overpay again for similar, higher priced but lower quality shirts from big brand names and boutiques. Leave some cash in your pocket and look great, ensures that you feel as good as you look every time you put it on! This shirt comes in a great range of sizes. BOWTIE & CUFFLINKS ARE INCLUDED! 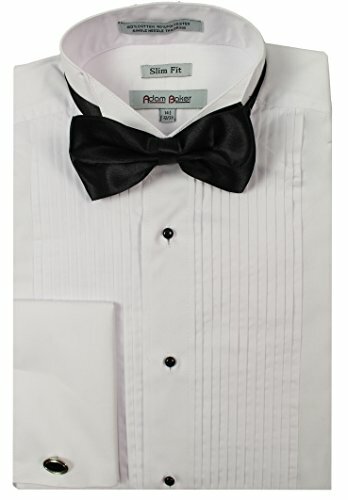 Slim Fit French Cuff Tuxedo Shirt - Stud & Button-Front Closure - Wing Tip Collar - Pleated Front - Bow Tie & Cufflinks Included are a perfect complement, but they can be swapped out for any other pair. MADE FOR COMFORT. Soft Luxury Crafted with High Quality Breathable Cotton Blend Fabric That Will Keep You Cool and Dry for Complete Comfort. PERFECT FOR ALL FORMAL EVENTS. From black tie events to cruises, weddings, and concert performances, this tuxedo shirt is sure to shine wherever it's worn.